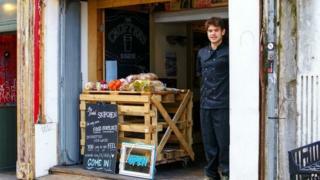 A cafe has opened in Bristol serving food past its sell-by date taken from supermarket skips and restaurants. Skipchen is being run as a not-for-profit cafe in Stokes Croft by campaigners highlighting the amount of edible food that is thrown away. Cafe manager Sam Joseph said: "We see them do it and get the food out and into a refrigerator straight away." The menu, which changes daily, has so far included lobster, gorgonzola omelettes and seafood platters. "We have a real mix of people coming to the cafe and they sit on two long tables, so you could have a businessman sitting next to someone who is homeless one lunchtime," said Mr Joseph. "People sometimes think they will be taking food from the needy when they come to us but the truth is there is so much to go round." The cafe, based in The Crofters Rights bar, has also made a deal with restaurant chain Nando's to take surplus chicken from its Bristol branches. Other fruit and vegetables are sourced from farms in the region. The cafe is also connected with the Gleaning Network where volunteers can harvest unwanted produce. "People used to share food with their neighbours but there's now embarrassment around it," said Mr Joseph. "We're offering a way to stop it going to waste." Mr Joseph, originally from Somerset, has himself lived on food taken from skips for the past three years. He is living on £5,000 saved from his student loan through not buying food. The cafe is the second of its type opened by The Real Junk Food Project (TRJFP). The first opened in Leeds nine months ago.